What is a latent structure influence process ? A stochastic process of human related behaviors normally involves a large and highly structured latent-state (probability) space. The latent structure influence process is a state-space model that effectively compresses the large latent-state space by exploring and exploiting the structure in this space. Compared with other state-space models that do not consider the structure, the latent structure influence process captures more information, is more frugal in its number of parameters, and is less likely to overfit. We have used the latent structure influence process to model the interaction of over one hundred persons and got interesting structural information as well as summaries of individual behaviors that could not be found otherwise. Influence Modeling of a imaginary Power Plant Network. (a) Noisy observation of 6 power plants. (b) The computed influence of the power plants from the observation (a). (c) The computed state sequences of the power plants from the observation (a). Figure Influence Modeling of Power Plant Network above illustrates the structure that the influence model attempts to capture, and how the influence model captures the structure. 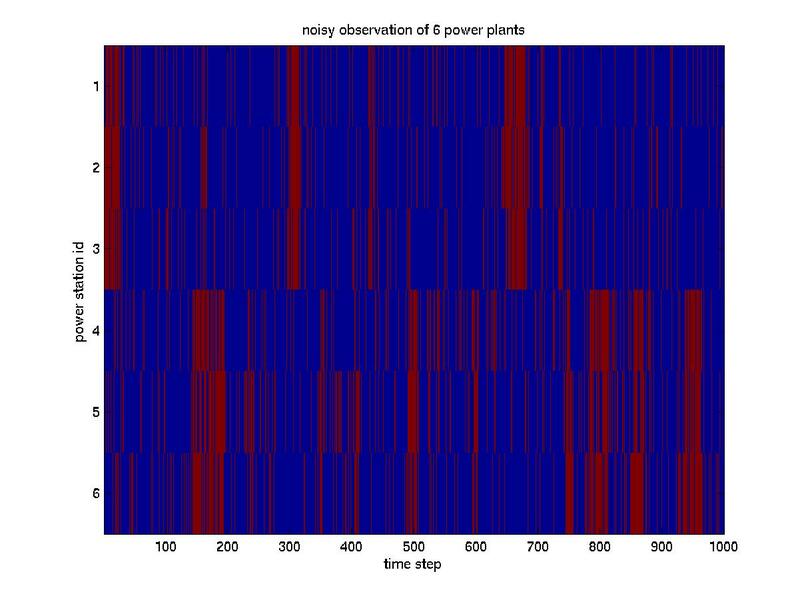 In this Figure, plot (a) shows a noisy observation (blue: normal, red: failed) of the state sequences of 6 interacting power plants. The interaction of the power plants has the effect that the state (normal, failed) sequence of one power plant is indicative of the state sequences of the related power plants. Our task is to infer the interaction structure of the power plants, and to filter the noise out of the observation. Plot (b) illustrates the reconstructed structure of the power plant network. It has <10% relative errors compared with the true influence matrix. Plot (c) illustrates the inferred state sequences of the power plants. 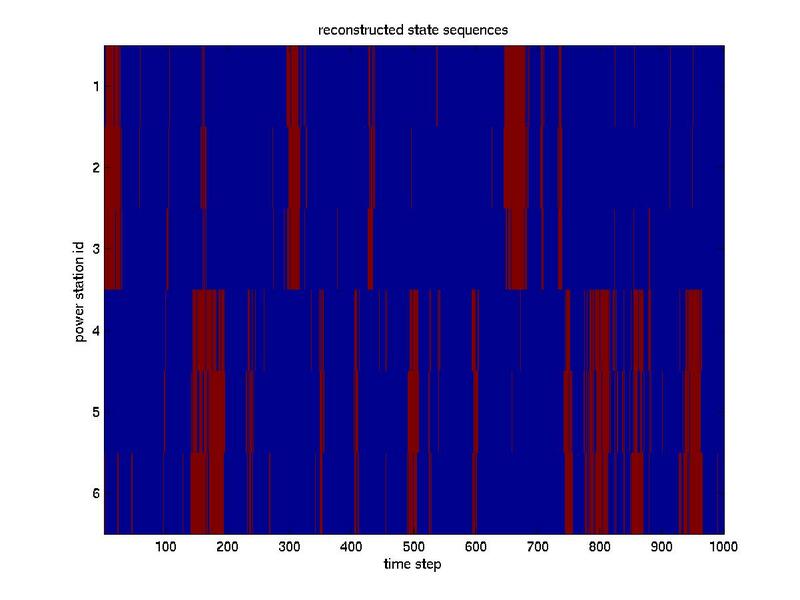 They have <5% relative errors compared with the true latent state sequences. The influence structure and the group polarization phenomenon often present themselves in human-related behaviors, as illustrated with the Reality-Mining example. 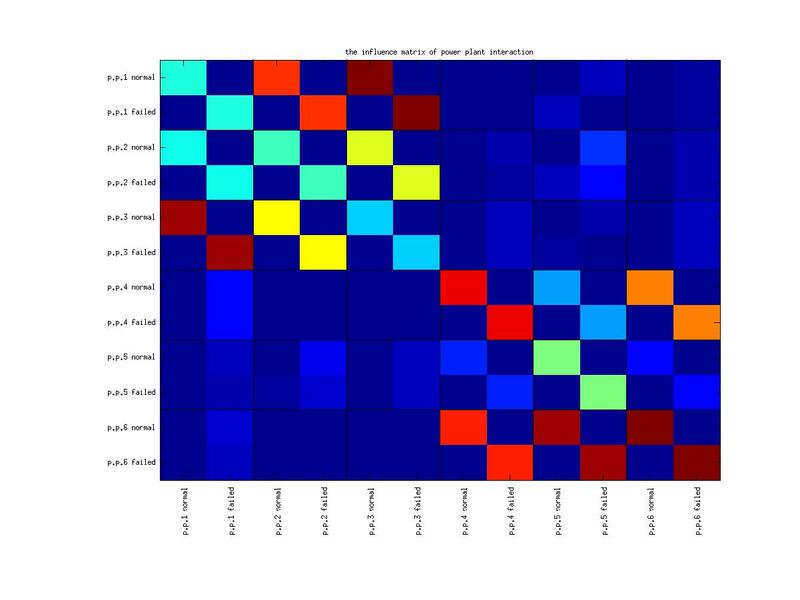 One task of the Reality-Mining project was to understand the social structure of the 81 participants, as well as to summarize their schedules, with a state-space model. Even if we assign only 2 states (in-office/ outof-office) to each individual, since the states for individuals can be freely combined, we end up with 281 number of states for the whole system of 81 participants. On the other hand, the human behaviors are highly structured. For one example, the participants tend to be in and only in their offices during the work hours. For another example, the more close two persons are, the more likely their schedules are predictive of each other. The latent structure influence process compresses the 281 number of unique states by modeling how the individuals' behaviors are close to each other. The MDS plot of this closeness information is given below. From this plot, we can see that the two smaller sloan groups are far away from the ML community, and they are slightly detached from each other. 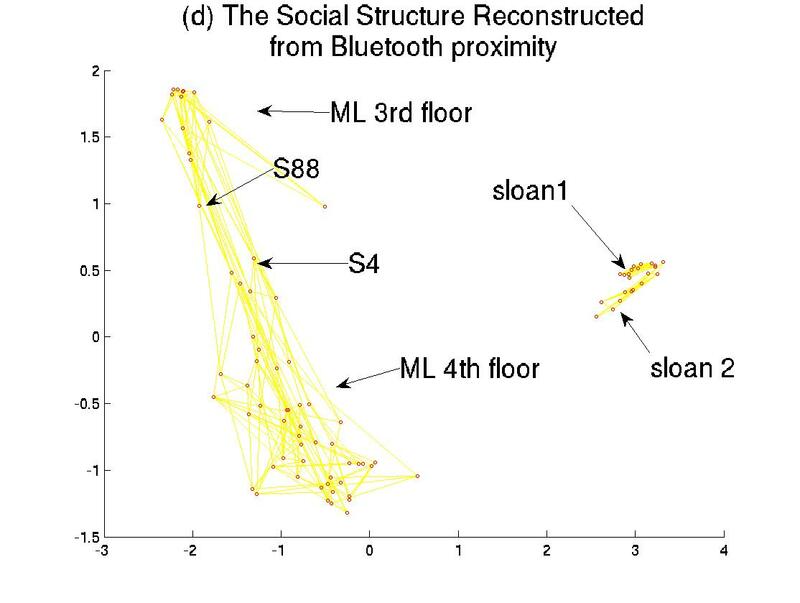 Another interesting finding is that the persons on the fourth floor of the ML building do not communicate much with the persons on the third floor of the ML building. The persons S88 and S4, among the few "connectors" of the third floor persons and the fourth floor persons, had research interests common to all people. This indicates that the geographical information is correlated with research interests, and friend circles. For a comparison, other modeling methods have more than six errors, and result in a less satisfactory social structure. How to use the influence model toolbox ?